As the election approaches, Chancellor Angela Merkel is working hard to dissipate anger over controversial surveillance by German and US intelligence agencies. But every time Berlin assures voters that all is well, its claims are discredited. Monday, August 5, was the day that the German government hoped would finally provide some relief in the ongoing surveillance scandal. That morning, a member of the Bundesnachrichtendienst (BND), Germany’s foreign intelligence agency, stationed at the embassy in Washington picked up four German officials at a local hotel. Driving in two dark sedans, they headed for Fort Meade in the state of Maryland, the headquarters of the National Security Agency (NSA), which gathers military intelligence for the US Department of Defense. The four were part of a high-ranking delegation that had landed in the US capital a day earlier. It included: Gerhard Schindler, the BND chief; Hans-Georg Maassen, his counterpart from the Cologne-based Federal Office for the Protection of the Constitution (BfV), Germany’s domestic intelligence agency; Klaus-Dieter Fritsche, a state secretary at the German Interior Ministry; and Günter Heiss, intelligence coordinator for German Chancellor Angela Merkel. Keith Alexander received his German visitors in a windowless, air-conditioned conference room. He greeted them with a friendly “How are you?” — as if nothing had transpired over the past few weeks. Alexander, 61, is a graduate of the legendary West Point military academy, a four-star general, the father of four daughters and, for the past eight years, director of the NSA. And he was also the man who was supposed to take the pressure off Merkel’s conservative government. And Alexander delivered. He had his people prepare a paper: a single sheet of white paper, but one without letterhead or a cover letter or a name to indicate that someone could later be held accountable. This impersonal list of facts had been approved, word for word, by the agency’s legal department. According to a German translation of the document, it says that the NSA abides by all agreements that have been reached with the German government, represented by the German intelligence agencies, and has always done so in the past. The general’s note was what the Germans have been waiting for all these weeks. It was the document that they had long been hoping would absolve Berlin of all responsibility in the data scandal sparked by the intelligence leaks of former NSA contractor Edward Snowden. This slip of paper is supposedly proof that the Germans — and, indeed, the NSA — have done nothing wrong. Just one week earlier, a second German delegation in London had received a similar statement from the NSA’s British counterpart, the Government Communications Headquarters (GCHQ). The key sentence in that document also says that the GCHQ’s work is subject to the legal requirements of both countries at all times. Indeed, ever since Snowden leaked the first classified documents early last June, the true extent of US data surveillance has remained unclear. Hardly any of the allegations have been credibly refuted — not even by the Chancellery. Under the search term “#PofallabeendetDinge” (literally, “#Pofalla puts an end to things”), Tumblr bloggers have been poking fun at the sheer chutzpah of the Merkel aide with quips like “In my view, Schubert’s 8th Symphony is now over.” They have a point: It’s certainly not every day that the government itself officially lays to rest a political scandal. Pofalla’s defense strategy rests on a shaky foundation: The German government is relying on the solemn statements of British and US intelligence agencies. Yet it has turned a blind eye to the fact that spreading disinformation, maintaining secrets, bending the rules and using lies and deception are as integral to the game of espionage as Parmesan cheese is to spaghetti Bolognese — even among the intelligence agencies of democratic states. Following their meeting with NSA General Alexander at Fort Meade, the four German officials met in early August in Washington with James Clapper, the US director of national intelligence. He also assured the visitors that everything was done by the book. In Pofalla’s eyes, this also makes him a key witness for the government’s defense. But Clapper may not be the most reliable source. Last March, he told the US Senate Select Committee on Intelligence that the NSA did “not wittingly” snoop on the communications of American citizens — a statement that was shortly thereafter exposed as a lie. The credibility of other key witnesses for Pofalla has also been shaken. Alexander and his NSA have come under increasing pressure for deceiving the public on a number of occasions. The NSA initially reacted to the Snowden leaks with a “fact sheet.” Two influential senators from the intelligence committee later criticized this document as “inaccurate” and “misleading” on the issue of whether American citizens could be affected by the NSA’s Prism surveillance program. Now it seems clear that the NSA can search through its database of American citizens’ phone calls and emails, even without a warrant, thanks to a legal loophole dating back to 2011. Furthermore, the intelligence agency has the authority to collect the communications of Americans who are in direct contact with “foreign targets,” as the NSA calls them. Last Thursday, however, the Washington Post revealed that the NSA has violated the privacy of US citizens and overstepped its authority thousands of times every year. For instance, the Snowden documents reveal that, due to a programming error, phones calls in Washington (area code 202) were intercepted because of confusion with Egypt (area code 20), the actual target of the surveillance. It comes as little surprise, though, that this escaped the attention of the branches of the government charged with overseeing NSA activity. The most recently disclosed documents reveal that the NSA instructs its analysts not to provide too much detail in their reports to the US Department of Justice and Clapper’s Office of the Director of National Intelligence. The public justifications made by the NSA bear a startling resemblance to the fine semantics of statements that have been made by German officials, which must be read very carefully. One example of this is the most comprehensive press release in the history of the NSA, which the intelligence agency released on Friday, August 9. In one shaded section of its seven-page declaration, the NSA vaguely writes that it “touches” only about 1.6 percent of worldwide Internet traffic every day — without providing any further explanation of its unusual use of the word “touch” in this context. It may not sound like much, but this is actually an enormous amount of data. In effect, 1.6 percent of one day’s global Internet traffic means that the NSA “touches” or “collects” some 29 petabytes per day. This would be roughly three times as much data as is contained in the Internet Archive, a nonprofit digital library whose stated mission is to provide “universal access to all knowledge.” The archive has stored, among other things, 150 billion websites. But the figure “1.6 percent” is misleading for another reason. Only a fraction of global Internet traffic is interesting for intelligence agencies. Emails and chats are targeted, for instance, but not necessarily the millions of videos that are sent or uploaded every day online. Given these circumstances, the Snowden affair is far from over — especially for the parliamentary opposition in Berlin. 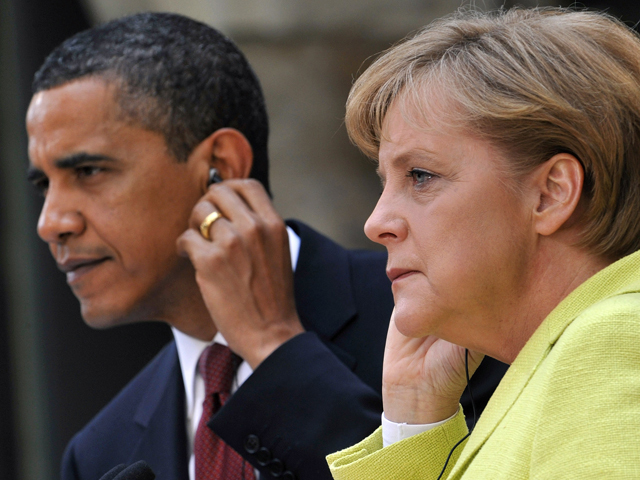 “We know that Germany is targeted by the NSA’s surveillance activities, and we know that Prism and XKeyscore exist. We know that there are hardly any legal limits to the foreign surveillance of the NSA,” says Thomas Oppermann of the center-left Social Democrats (SPD), who chairs the parliamentary committee in Berlin charged with overseeing the work of German intelligence agencies. “What we still don’t know is from where, and to what extent, the NSA accesses information about German citizens,” Oppermann says. “The NSA is saying nothing about this, and the German government has not been able to find out anything,” he adds. “It’s not supposed to be in Germany. That’s all we know,” he concludes. These are questions that Pofalla failed to answer last Monday during a five-and-half-hour session with the committee. Instead, Merkel’s chief of staff first read a long-winded statement, without allowing any interruptions for questions. What’s more, he referred to numerous documents that had not been made available to the committee. As of last Friday evening, the Chancellery had still not met requests to provide copies of the documents. Pofalla, says Social Democrat Oppermann, is pursuing an “unfair, one-sided and selective spreading of information.” The minister is acting “like a second general secretary of the CDU,” he adds, referring to Merkel’s conservative Christian Democratic Union. At a press conference following his session with the committee, Pofalla also read from a prepared statement — and with good reason: After all, this was yet another statement riddled with subtle nuances. On a number of occasions, Pofalla said the US agencies had “explained” processes and provided “written assurances” that they adhered to applicable laws “in Germany.” This can be clearly interpreted as follows: Apparently the German government has no knowledge of the situation and has to rely on the assurances of foreign intelligence agencies. Pofalla’s response says little or nothing about what, if any, data related to Germany has been collected by the NSA. These days, very little purely domestic German digital traffic is transferred solely via German telecommunications networks. Even emails exchanged within the same city or chats with a neighbor can be routed via American or British servers and intercepted there by intelligence agencies — all in accordance with these countries’ domestic laws. “Not possible to rule out” — that doesn’t sound as if the allegations “can now be dismissed,” as Pofalla maintains. Indeed, interpreting the responses provided by the German government is really a job for experts in the art of political and legal hairsplitting. There are no signs of a “national surveillance,” according to government officials. But does the word “national” have much meaning when dealing with global data streams? The “personal data” of Germans is not passed on, the government insists. But does this mean that other data is transferred to the Americans? Only last week, though, SPIEGEL reported that the NSA maintains a cryptology center in Griesheim, near the western German city of Darmstadt. In fact, the NSA says that this center is its largest analysis and production unit in Europe. The NSA also reportedly has operations at the Mangfall military base, in the Bavarian town of Bad Aibling, and in Wiesbaden, in the central German state of Hesse. Yet the German government allegedly knows nothing about any of this. Still, at least the government’s response provided a bit of new information. For example, attentive readers learned the Federal Prosecutor’s Office, based in the western city of in Karlsruhe, has received roughly 100 criminal complaints based on the Snowden leaks. Indeed, despite all of the government’s assertions, the affair is far from over. This Monday, Pofalla is due to testify once again before the parliamentary intelligence committee. It will probably not be his last appearance. The opposition intends to summon him again before the German general elections are held on September 22. It’s very possible that Merkel’s close aide will then be asked to testify on another related matter. For weeks now, as a direct consequence of the Snowden affair, Chancellor Merkel and Economics Minister Philipp Rösler (FDP) have been calling for Germany and Europe to free themselves from their dependence on the US in the realm of IT technology. The government has issued an official cabinet decision on this issue. At least the German government has hired professionals. Consulting giant Accenture is currently interested in purchasing Booz. For many years, Accenture’s key accounts included the US Department of Homeland Security — and the NSA. Booz is also a company with an interesting past. In 2008, the firm broke away from Booz Allen Hamilton. Today, this NSA service provider’s most prominent former employee has gone into hiding in Russia: His name is Edward Snowden. Esse post foi publicado em Alemanha, EUA, Inteligência e marcado BND, eleições Alemanha, Merkel, NSA, Obama, Snowden, vazamento por Joanisval. Guardar link permanente.